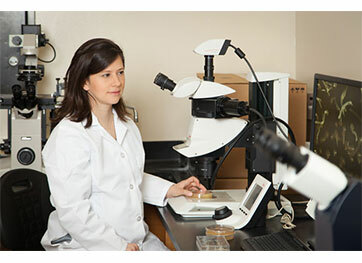 Elizabeth Ostrowski, University of Houston evolutionary biologist, observes multicellular structures of Dicty, a soil-living, social amoeba, to study genes related to cooperation and conflict. HOUSTON, June 4, 2015 – Nobody likes a cheater. In a recent study, a University of Houston evolutionary biologist and her collaborators found that while cheaters do not take over populations, they also cannot ever fully be removed. By identifying how diverse societies prevent or cope with cheating, the researchers say they can identify general principles about how to promote cooperation and prevent conflict. Led by Elizabeth Ostrowski, an assistant professor in biology and biochemistry at UH, the work was a collaboration between a number of different laboratories specializing in the study of Dictyostelium discoideum, or Dicty, which is a species of soil-living, social amoeba commonly referred to as a slime mold. Supported by grants from the National Science Foundation, their findings are described in a paper titled “Genomic signatures of cooperation and conflict in the social amoeba,” appearing June 15 in Current Biology, a scientific bimonthly journal published by Cell Press. Ostrowski is the lead author. To do this, Ostrowski and her colleagues examined the molecular evolution of genes important for cheating behaviors in Dicty. In this organism, individual amoebae gather together upon starvation to form a multicellular organism. During this process, approximately 20 percent of the cells altruistically give up their lives to form a rigid stalk that supports and helps the survivors to disperse as hardy spores. Some individuals, however, cheat, failing to form the stalk themselves, yet benefitting from its production by others. Genetic screens identified more than 100 genes that impact cheating behaviors in Dicty. The researchers used genome sequencing to identify naturally occurring DNA differences in these genes and molecular evolution analyses to test different scenarios about the dynamics of these genes in natural populations. The scientists framed their study by defining several hypothetical scenarios for the evolutionary dynamics of cheating behaviors in Dicty. They examined it from a standpoint of an arms race, a stalemate or a mutation-selection scenario. Each made different, testable predictions about DNA diversity in and near the social genes. In the arms race scenario, epidemics of cheating and resistance successively sweep through populations. In the stalemate, cheating becomes endemic but does not take over the population. In the mutation-selection scenario, cheating mutations keep popping up, but are quickly removed by selection because they are not favorable. An arms race would have shown up as a lack of variation in the DNA in or near the social genes. More evidence for a stalemate surfaced when they compared strains from two different populations, one in Texas and the other in Virginia. The populations differed less at the social gene locations than at other genes, suggesting that some selective force was working to maintain the same variants of the social genes in both the Texas and Virginia populations. Both the increased genetic diversity near the social genes and the failure of separated populations to drift apart at those genetic locations support the stalemate scenario. Strassmann and Queller are pioneers in the study of Dicty as a model system for social evolution. In addition, the expertise of researchers at the Human Genome Sequencing Center at Baylor College of Medicine was crucial to the project and instrumental to the successful completion and analysis of the genome sequences. The University of Houston is a Carnegie-designated Tier One public research university recognized by The Princeton Review as one of the nation’s best colleges for undergraduate education. UH serves the globally competitive Houston and Gulf Coast Region by providing world-class faculty, experiential learning and strategic industry partnerships. Located in the nation’s fourth-largest city, UH serves more than 40,900 students in the most ethnically and culturally diverse region in the country. For more information about UH, visit the university’s newsroom.